Many regular Americans and celebrities are using an acai berry cleanse to become healthier and lose weight. 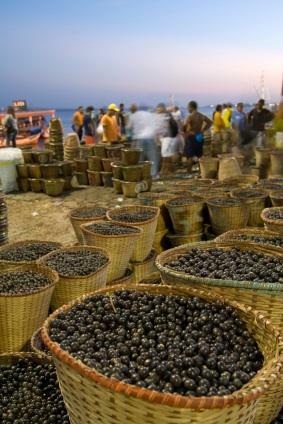 The acai berry is a small, round, black fruit with powerful antioxidant properties. Is is commonly found in health foods and juices and has even become a popular ingredient in some ice creams for its unique and amicable flavor. The berry is an important component of the Acai Berry Diet and offers a number of health benefits. Following is what you need to know about an acai berry cleanse. You may wonder why acai berries in particular are so good for you. While the berries do have many purported claims, the scientific properties of the fruit confirm that they're the real deal. Almost everyone knows that antioxidants important nutritionally; they eliminate free radicals and prevent and fight cancer. Today, scientists can actually measure how powerful the antioxidants in a particular food are by using the Oxygen Radical Absorbance Capacity (ORAC) method. Using this method, scientists have discovered that the acai berry's potent 4:1 extract ratio is the highest quality found anywhere. The fruit has more powerful antioxidants than even blueberries or pomegranates. With a ratio this high, scientists say that the impact of consuming acai berries will be significant and noticeable even after only a short period of time. With properties like these it's no wonder that the acai berry has been dubbed a super food. Now that you know how good acai is, you may wonder why you should do a cleanse. Using the berries in a cleanse will help flush out free radicals in your system since the fruit is a powerful antioxidant. Eliminating these toxins from your body through a cleanse comes with many benefits. One of the most sought after benefits is weight loss. The fruit has a natural concoction of essential fatty acids, fiber, phytosterols and amino acids that allow you to burn fat more efficiently. While you still need to diet and exercise to lose weight, taking in the berries should help you lose weight quicker. Additionally, the fatty acids and amino acids in the fruit will aid in both muscle development and proper digestion, which are essential components for fat loss. You should really consult with your doctor or nutritionist before you do an acai berry cleanse. A cleanse mostly involves taking substantial amounts of the berries in place of other foods in your diet to flush the free radicals and toxins out your system. However, knowing the proper amount of berries to take is important. Due to the elevated levels of fiber in the berries, if you take too many you could experience diarrhea. You should plan to do an acai cleanse for about five to seven days. In preparation for this you should eliminate sugar, processed foods, excessive carbohydrates, unnatural fats and all junk foods from your diet a few days prior. Next you'll need to start taking the berries themselves. You can take the berries as a raw fruit, in a juice or as a supplement. However, most people take supplements and juices since they're more convenient and it can be hard to find raw acai berries. Acai berry supplements and juices have grown quite popular and can now be found in most health food stores. You should then start the cleanse by gradually increasing the amount of acai you take. For the best results, when doing the cleanse you should only consume acai and other vegetables and fruits. Juices with protein powder and leafy green salads make excellent meal options. When you have done this for five to seven days, slowly re-introduce regular foods back into your diet. Doing this too abruptly can lead to stomachaches. How much acai you should take depends on your body. Most manufacturers of supplements say to gradually increase the amount until you start to experience some diarrhea and then to cut back. Doing an acai cleanse does pose some risks; mainly, you have to ensure you get enough nutrition during the cleanse. If you're deficient in something you risk mal-health, especially if you have a condition such as anemia or diabetes. Additionally, if you take too much acai you will most likely have diarrhea. The best idea is to consult your doctor first, to make sure that you're healthy enough to receive the positive effects from doing a cleanse. Acai berries can be a great way to lose weight and be healthier. However, again you should use caution when taking the supplement. It's important to ensure that you get enough vitamins and nutrients when doing a cleanse.